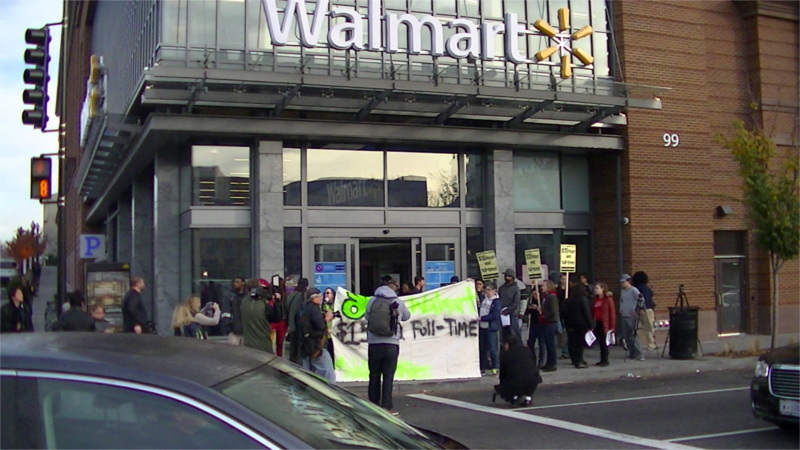 On Black Friday, the 27th of November, protesters showed up in front of the H st Wal-Mart. They were demanding that Wal-Mart pay all of their "associates" $15 an hour and offer all of them full-time hours. A speaker at the DC protest cited workers having to go hungry and not eat in order to pay rent, due to the poverty wages Wal-Mart pays. This protest was part of the "Fast for 15" in which over 100 Wal-Mart workers and over 1,000 supporters fasted for one or more days to call attention to outright hunger caused by Wal-Mart's low wages.